When it comes to handbags, these days there are almost as many ways to jazz up your existing bag as there are new designs. In Selfridges' vast accessories hall in London, you can buy a clip-on set of metal flowers from Louis Vuitton, multi-coloured jangling robots from Prada, and leather tassels at Ted Baker. What customers want, it seems, is a way to stamp a bit of individuality on their purchases. And one new counter at Selfridges will let you go a stage further. 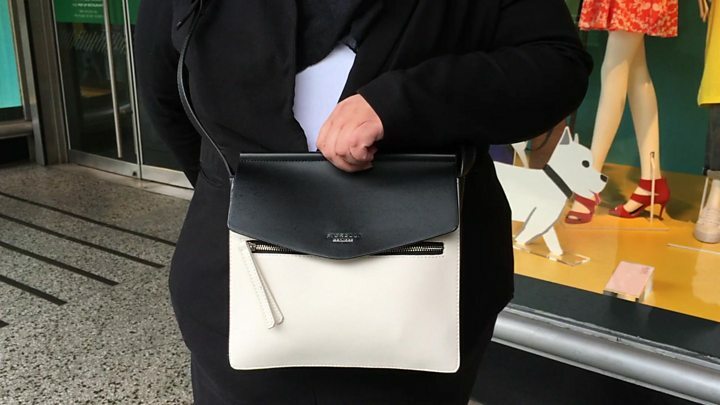 At Mon Purse, an Australian brand, you are handed an iPad and samples of leathers, and given the chance to design your own handbag. "I was looking around for the perfect handbag and I just couldn't find it," explains Lana Hopkins, 33, the company's founder. "And I was quite heartbroken, you know?" Wandering through a Sydney shopping mall one day in 2014, Ms Hopkins stumbled upon Build-A-Bear, a shop where you can assemble your own cuddly toy with some limited variables such as fur, colour and clothing. Although Ms Hopkins was rather older than the average customer, she found creating a teddy for her nephew gave her an extra emotional connection to the product. And the idea for Mon Purse was born. Skip forward three years and Mon Purse now has eight outlets in Australia, three in the UK and two in the US, including a newly opened concession in Bloomingdales, San Francisco. Last December, buoyed by Christmas, it sold almost $2m (£1.6m) worth of bags, ranging in price from $75 for a simple pouch, to $620 for an extravagant tote. The handbag industry is the latest retail sector to wake up to the possibilities of allowing customers to design their own product. And with people now increasingly used to having things their own way, be it configuring their own music playlists or choosing their exact sandwich fillings, industry insiders say demand for personally designed handbags is soaring. Media captionWhat would your dream handbag look like? "I've never seen a cultural shift like this in the marketplace, and it's giving me whiplash," says Frank Zambrelli, co-founder of 1 Atelier, a New York-based handbag company. To avoid the sky-high prices of a fully bespoke service, which would see customers be able to follow their every whim, most design-your-own handbag firms - such as Mon Purse - instead use the "mass customisation" business model. This means that customers can design their own handbag, but only from a combination of set styles, sizes, colours and materials. So while Mon Purse promises billions of possible variations, in practice the choice is limited to 19 different bag shapes in 35 different colours. This, however, is typically substantially more customisation than offered by established bag-makers. While brands such as Gucci, Coach and Longchamp allow customers to change some elements, the business model of the larger firms still revolves around placing large orders for a design that their in-house team predict will be popular. The new wave of small companies set up to deliver customisation flip that model on its head. Mon Purse uses a visualisation tool based on 3D gaming technology, through which the customer can select size, leather texture, the type of metalwork, and shade of lining. The bag then takes approximately two to four weeks to manufacture. Launched just seven months ago, 1 Atelier allows customers to combine colours from a carefully selected palette for the body, side panels, straps and pockets of 10 different bag designs. But if in the past buying something unique meant a price tag to match, now you can actually make the tailor-made item for less than the mass-manufactured equivalent, according to Mr Zambrelli, who was previously a designer at Chanel. "Because we're not putting together a collection based on some inspiration and hopes that we've got the trend right, we're not placing any inventory buys," he says. In other words, they will never be left with unsold stock, which he says more than compensates for not having the economies of scale of a large order. However, prices at 1 Atelier do still range from $295 to $7,380, depending upon the materials and size of bag chosen by the customer. For a significantly cheaper personally designed handbag, Indian company Toteteca will sell you one for between $25 and $40. It makes its bags from polyvinyl, choosing not to use leather for what it says are ethical reasons. "You'd be amazed how inexpensive it is to make custom-made bags," says Kushal Chudiwala, the 31-year-old founder of the Mumbai-based business. Perhaps thanks to the low prices, Toteteca seems to free up customers' creativity. While 70% of Mon Purse's customised orders are still a version of a black bag, Toteteca's customers are more adventurous. "We don't make many black bags," says Mr Chudiwala. But they do sometimes feel the need to rein in customers' wilder ideas, he says. "When we first launched, we had a customer select a combination that looked like a handbag for a joker, green and yellow and pink all mixed into one product," he says. When queried the customer stuck to their design, so Toteteca went ahead and made the bag. At 1 Atelier, Mr Zambrelli was initially "hell-bent" on configuring its design tool so that choosing one element would limit the subsequent options, avoiding the possibility of a customer "creating something absolutely hideous that we wouldn't want our name on," he says. But in the end they decided against it. "And I'm so glad we did that, because, shame on me, my eyes have been opened up," says Mr Zambrelli. "Many people have put together combinations of materials and colours that as a designer for 25 years were anathema to me. And I was 100% wrong. I'm ashamed actually at how narrow my vision was of what works." But 1 Atelier, Mon Purse and Toteteca's founders do all agree that there is such a thing as too much choice - that customers can feel baffled and overwhelmed without some guidance, or narrowing down of the options. Mon Purse's next step will be to offer an algorithm-based design service, to those "feeling a little lost". "We can tap into your Facebook [photos] and see what your favourite colours, textures and designs are, and say you might like A, B and C," says Ms Hopkins. But ultimately, if you lack an inner accessories designer, and your Facebook account doesn't provide inspiration, the safe option remains available - a nice, plain, black bag.